Welcome to Paradise, Marco Island, FL. Marco offers you a year round, relaxing vacation on Southwest Florida's Gulf Coast. Marco has Florida's best weather with an average high temperature of 84 degrees and warm gulf water. Our lovely waterfront home is steps (approx. 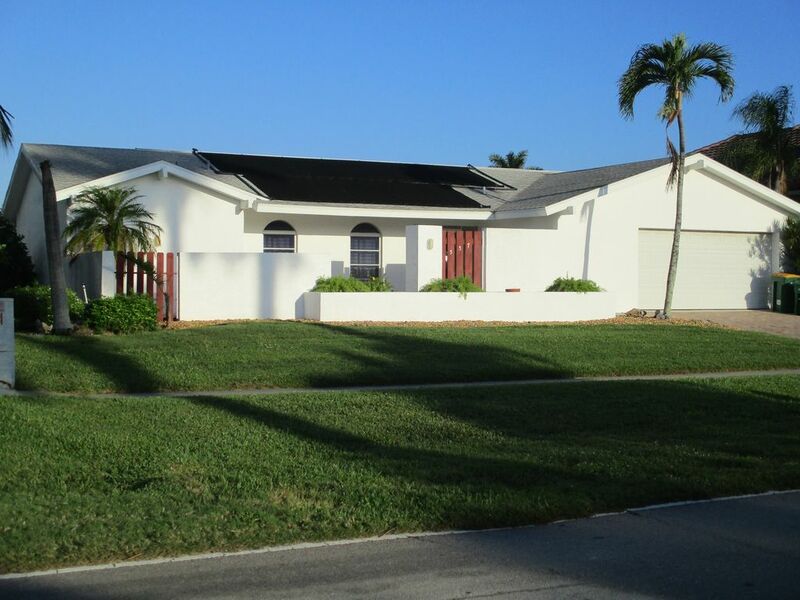 300 paces, or 0.1 miles) from Tigertail Beach, has its own large pool, spacious lanai with gorgeous waterview and dock. The home is air conditioned and its western exposure is ideal for sunny afternoon pool activities and sunsets on Marco. Master bedroom has king size bed and an updated private bathroom with a large rain shower. Second bedroom has two twin beds which can be put together to create a king size bed, and bathroom. All rooms feature wonderful views of the water and pool area and you can even fish in the canal! Comes fully furnished with linens, towels, fully equipped kitchen, washer & dryer. For the price of a hotel room you can stay in a luxurious house with your own private kitchen, swimming pool. Once you have rented our house for a family vacation, or even a relaxing get-away for two, you will never want to go back to a hotel! We are a retired couple and are in the vacation rental business. Our rental house is nicely situated, close to Tigertail Beach, close to shops and restaurants. Perfect house and location for our family! This was our 2nd year staying at this house. The owners made some renovations since our first stay and they look really nice. The house was immaculately clean just like the first time we rented! The house is an easy walking distance to tigertail beach, has a pool with a grill and is on a canal which allowed us to dock our rental boat for a few days. Our family enjoyed fishing off the dock, seeing pretty sunrises & sunsets and an occasional dolphin! We are very happy that you enjoyed your stay at our vacation rental house. Loved being able to ride bikes to Tigertail Beach and watch the sunset. Beautiful neighborhood. Pool was warm and relaxing. My husband and daughter loved waking up and fishing in the canal and ending the evening there as well! Prima huis op een uitstekende lokatie! Wij hebben een uitstekende tijd gehad op Marco Island, het huis voldeed volledig aan onze verwachting. Het huis is recent voorzien van nieuw sanitair en met name de ligging, op loopafstand van het strand, vonden wij een enorm pluspunt. Wij hebben veel gebruik gemaakt van de fietsen, op Marco Island kan je bijna alles op de fiets doen wat erg prettig is. Een volgende keer op Marco Island zullen we zeker weer voor dit huis kiezen om van het strand, de sunset en de dolfijnen te genieten! Very comfortable house, the kitchen and both bathrooms are beautifully updated, very well maintained. This house is close to everything. We are coming back in December again. This house was perfect for our family of 4! Located in a quiet part of town just a short/easy walk to gorgeous Tigertail Beach, we couldnt have asked for a better spot! Although the home is older, it's quite spacious for a 2 bedroom house and was very clean. We loved using the gas grill and the pool on the lanai and the owners were gracious in allowing us to dock our rental boat at the house for 3 days. Our boys enjoyed fishing off the dock each morning as well. The sunsets across the canal were beautiful. Happy to have found such a tranquil spot for our visit! Good location offering walking distance to Tigertail Beach & Park overlooking mangrove area; another quite a bit longer walk to the gulf beach. This wasn't an issue for us but might be for others toting beach equipment, etc. The home itself is an older home and some of the interior reflects its age such as dated and/or worn cabinets, vanities, etc. The neighborhood is nice & largely made up of newer/larger homes. The outside pool deck area is spacious and offers several seating options, as well as a nice view of the canal and watching various watercraft. Note: while the rear of the home's main living/dining area offers a wide expanse of windows and a sliding door overlooking the pool deck and canal, there are no curtains/blinds if you desire privacy in the evening from the neighbors across the canal. We did meet the owner and Rudy was very friendly and thanked us for our stay. Thanks for your review, like the review stated our vacation house is an older home amide newer homes, but we are continuing to update it. Scheduled for this year is to update the kitchen and guest bathroom. Marco Island has a variety of activites including swimming, sunbathing, beachwalking, shelling, beautiful sand beaches,volleyball,children's playground, beach food concession, snorkeling, boating, fishing, golf, casinos, tennis, shopping and world class restaurants. Everglades National Park is a short drive. Islander Boat Tours, Naples, offers sight-seeing and fishing excursions through the Ten Thousand Island. Corkscrew Swamp Sanctuary offers tour of a virgin forest of 500-year old cypress trees. Nearby airports at Naples and Fort Myers. IMPORTANT INFORMATION: Contrary to the national and international news media reports that all Southwest Florida beach have Red Tide and green algae bloom, Our Marco Island beaches are clean and pristine condition. Contact us to see live beach webcam.